Many of those who order it without seeing the tablet "in the flesh" are going to be badly disappointed. TABLET CALLED "Surface with Windows RT" has a clever keyboard built into its sometimes-optional cover. But it can't run normal Windows software despite the impressive name. Windows users who have resisted buying into the Apple iPad ecosystem now have their own kind of tablet. It comes from Microsoft, the once-powerful rival to Apple that has lost much of its luster -- and stock value -- in recent years. Microsoft's working hard to fight back, the the new tablet is one of its efforts. It has an innovative design, with a thin keyboard built into its cover, a touch screen for those who want to use it more like an iPad, a wide-screen view and a fold-out leg that's part of the tablet itself. But that's where the good news ends. The bad news is that practically everyone who shows an interest in the new tablet is going to end up confused. Even worse, many of those who order it without seeing the tablet "in the flesh" are going to be badly disappointed. First, the new tablet has a confusing name. It's called "Surface with Windows RT." Come again? Not "Tablet" or "Pad" or "Slate" or even "Kneetop Writing and Reading Device"? C'mon, Microsoft. The Earth has a surface. Your tablet doesn't need to sound pretentious. Send your Committee on Names back to work. But here's the real zinger. The tablet's operating software, called, of course, Windows RT, sort of reminds us old timers of Windows NT, that legendary incarnation of the Windows operating system used in corporations for a decade. But the Windows RT tablet-- 'scuse me, "the Surface with Windows RT" -- won't run true-blue Windows software. It only runs Windows RT programs, which you can only get by buying them from the Microsoft App Store. In other words, it won't run Adobe Photoshop, Microsoft Outlook, Winamp, Microsoft Access or a zillion other all-time favorite Windows programs. Everything running on a Surface with Windows RT tablet is specially coded for that tablet and bears no resemblance to what you run on your Windows PC. And all this, despite the name. This is worse than ridiculous. No iPad would ever claim to be a Mac, and no Microsoft tablet should claim to run Windows software unless it actually can. Unsuspecting consumers are naturally going to assume that "Windows" really means "Windows." Microsoft has taken a gigantic misstep. And there's even more. 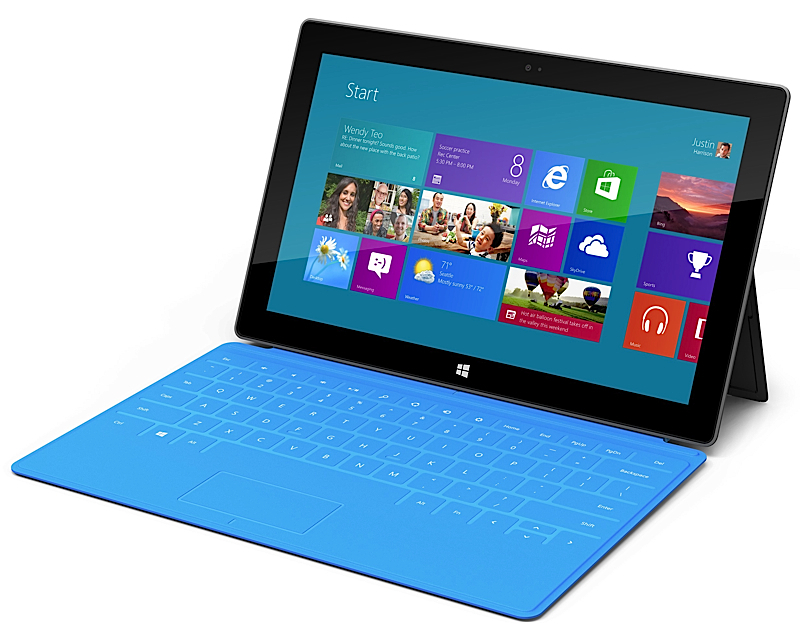 Surface Pro -- the tablet, not the Earth -- will run an actual new version of Windows. It's called Windows 8. It's the real thing, more or less. More, because the normal Windows things it does are great, with extra safety and speed. Less, because it also has all that abnormal non-Windows Surface stuff, too, and when you run Windows 8 you always (as in ALL THE TIME) get the abnormal stuff in your face first. It greets you, or maybe leers at you, as soon as you turn on the computer. And, sad to say, there's even more. That new version, Windows 8, can be installed on most newer PCs, too. Such as on your current PC. But why would you want to, when Windows 7 is a perfectly good version of Microsoft's operating system, if you want to remain a Microsoft trueblood? And if you don't want to, remember that the Mac is just an order form away. Even if you never choose a Surface with Windows RT tablet, from now on the experience of buying a new desktop Windows PC is almost guaranteed to include an unwelcome introduction to the hybrid "is it real, or is it Microsoft?" version of Windows. It's sad to have to say this, but don't let yourself be fooled.